Antibiotics and various advances in medical treatment have led to overall growth of life expectancy. However, along with positive aspects of prolonged life, humanity has faced a new challenge – age-related deceases. Parkinson’s disease along with Alzheimer’s disease are among typical disorders, which are common among elders with an average onset above ~60 years. The deceases share a diagnostic “feature” – the presence of amyloid deposits. The term amyloid usually refers to rod-like protein aggregates with a cross-β structure. Another feature which amyloid aggregates do share is the unusual kinetic behavior. Typical kinetics of amyloid formation goes through a nucleation process (which implies concentration dependence for reaction to occur, i.e. critical concentration) and has a prolonged lag-phase and fast burst-like growth phase. As it was shown in several papers, the burst-like or “exponential” kinetic behavior can only be explained in terms of structural features of aggregates, i.e. the possibility of aggregates to branch, to break in fragments or in the case of a non-fibrillar form to enlarge adsorbing monomers by whole accessible surface. Fig. 1. 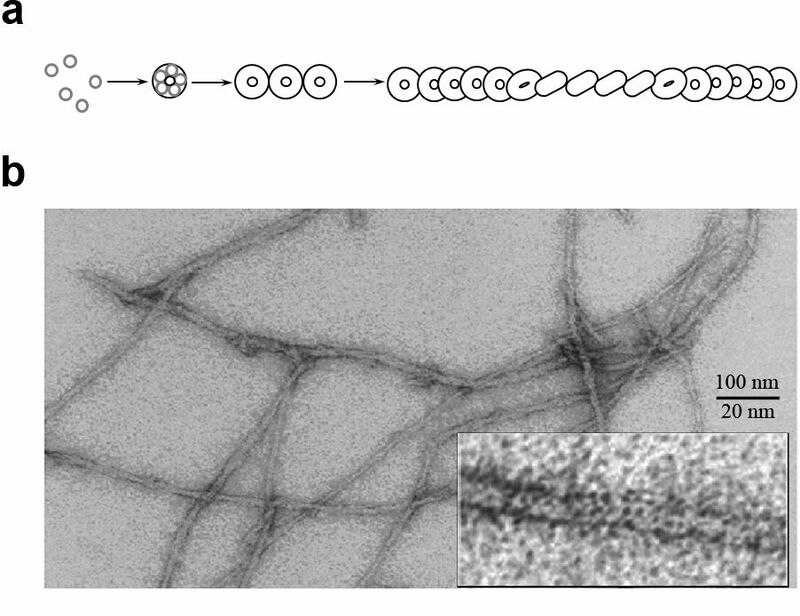 Higher magnification of the electron microscopy image reveals microstructure of Aβ42 synthetic fibrils, which consist of donut-shaped oligomers lying on top of each other. a) Suggested pathway for fibril formation; protein particles through nucleation process form stable monomers which then can be assembled as oligomers and in this form aggregate into mature fibril. b) Micrograph represents Aβ42 fibrils with different magnification. Therefore studies of the structure of fibrils together with the study of kinetics of their formation can shed light on some decease progression events. In this paper we have studied amyloid aggregates formed by recombinant and synthetic Aβ40 and Aβ42 peptides, which emerge in the brain of people with Alzheimer`s disease in the form of plaques. The analysis of kinetics revealed that both peptides are prone to form branched amyloid aggregates with formation of a secondary nucleus on the surface of growing fibrils. It is interesting that both primary (the most unstable state on the reaction pathway out of which fibril can start growth) and secondary (the specie on the reaction pathway which is responsible for fibril branching and thus for overall bursting of the aggregation) nuclei sizes are larger for Aβ42 by one monomer compared to Aβ40. Thus, the primary nucleus for Aβ42 is 3 monomers (2 monomers for Aβ40) and the secondary nucleus for Aβ42 is 2 monomers (1 monomer for Aβ40). While studying aggregates by electron microscopy (EM) we have discovered that the surface of aggregates is very rough. Roughness of the surface can be interpreted as a reason why Aβ40 and Aβ42 fibrils tend to branch and why the growth of amyloid deposits has such kinetic behavior (long lag-phase along with fast accumulation of aggregates). What is more amazing – we found that fibrils, apparently, consist of small, ring-like oligomers, which has never been described previously (see Fig. 1, the insertion). Fig. 2. Possible scenarios of stabilization of a protofibril nucleus: a) the nucleus size is 2 monomers, and b) the nucleus size is 3 monomers. The importance of such findings becomes more valuable because neurodegeneration in the course of Alzheimer’s disease is mostly associated with the emergence of “toxic” oligomers. Though the real nature of “toxic” oligomers is not yet clear (whether they are on-pathway or off-pathway aggregates during amyloid fibril formation) and further research is needed, we can speculate that small stable fibril parts are perfect candidates for this role. Combination of the obtained results on nuclei sizes, EM micrographs and facts on Aβ fibrils have allowed us reasoning to speculate on a possible fibril structure. It was shown previously by solid state Nuclear Magnetic Resonance that the cross-section of Aβ40 fibrils reminds a triangle; our findings along with details already revealed in the literature suggest that a possible cross-section for Aβ42 fibril has the form of a square (see Fig. 2). 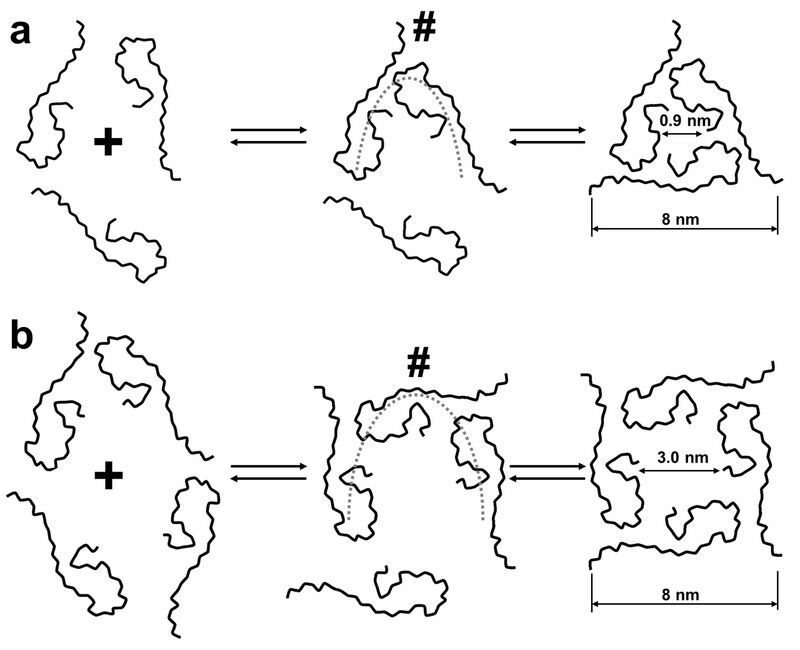 Such model is perfectly consistent with the calculated fibril nuclei sizes, i.e. the trimeric structure of Aβ40 fibrils arises from stabilization of unstable dimer aggregates, where in the case of Aβ42 the trimeric unstable structure is stabilized by the 4-th peptide. To the supporting evidence of this model one can address the similar width of Aβ42 and Aβ40 oligomers, but Aβ42 fibrils are a bit wider than Aβ40 fibrils due to less orderliness of ring-like oligomers in Aβ42 fibrils. As a direct consequence of the square structure, the fibril cross-section must have a hole in the center, which should be larger (~3 nm) than that inside the triangular structure (~1 nm). One of the possible mechanisms of amyloid fibrils formation based on the sizes of primary and secondary folding nuclei of Aβ40 and Aβ42.